Radiesse filler brings back a “V” shape form characteristic to young face. Thanks to it, look naturally young at any age! Can you remember what you looked like when you were 16? Almost like you look now, only … younger. The same face, but somehow, it lost its shape. Do you feel young and active but look older? Most people know the problem of mature age: no matter how hard you try to take care of your skin, only fancy creams, regular exercise, a healthy diet and liters of water is not enough. Make-up also can no longer conceal the signs of aging over time. The cell division process by which the skin continuously renews itself slows down from 25-29 years of age. The skin loses moisture and elasticity. The first fine lines appear around the eyes and mouth. The face is just not as firm and smooth as it used to be. It has been established and clinically proven by scientific research that Radiesse™ dermal filler has a twofold effect: the filler instantly fills and smoothes wrinkles and, in addition, stimulates the production of collagen, thus, helping the skin to regenerate. A young face has a “V”-shape. The younger the face is the firmer skin and clearer contours it has. The face then is symmetrical and has a “V” shape. With the age the “V” “capsizes”. However good your genes may be, skin of all types eventually loses its tone. Proportions of the face change and the volume of individual parts of the face reduces. Cheeks sink, chin becomes not tight anymore and the bottom of the face becomes more voluminous. The result: youthful “V” gradually “capsizes” and your age becomes much more noticeable – even if you feel youthful. To restore a youthful and bright look, often, it is not enough to treat just individual wrinkles. To offset the effect of gravity and regain the youthful shape of the face, the former volume should be restored. This can be achieved using the skin filler that stimulates natural production of collagen, giving impressive and long-lasting volume to a face or any other part of the body. Radiesse™ is a filler that instantly restores the lost tissue volume and restores volume exactly where it was. By gentle shaping deeper wrinkles, hollows or sags, sank cheeks disappear, and natural facial contours return. It is THE ONLY filler that stimulates natural collagen production. Because of the gel-matrix, Radiesse™ creates a quick visual effect. Radiesse™ small calcium micro spheres stimulate natural collagen formation in the skin, providing long lasting volume increase. The gel itself, as well as the micro spheres completely disintegrates in the body over time. Eyebrows. Radiesse™ raises eyebrows and “opens” eyes. Temples. Sank temples can be given volume. This will give your face a healthier, less tired look. Cheekbones. Increased volume in the cheekbone’s zone accentuates a “V”-form of the face and guarantees a youthful looks. Ear lobes. Full and smooth ear lobes seem more attractive. Nose – Lip wrinkles. The lines connecting the nose and the corners of the mouth add to aging looks when they deepen. They can be filled – the wrinkle ptosis (drooping) apparently due to gravity, when filled in, results in highlighting of the cheeks, which will make you look fresher and younger immediately. Cheeks / Hollow cheeks. 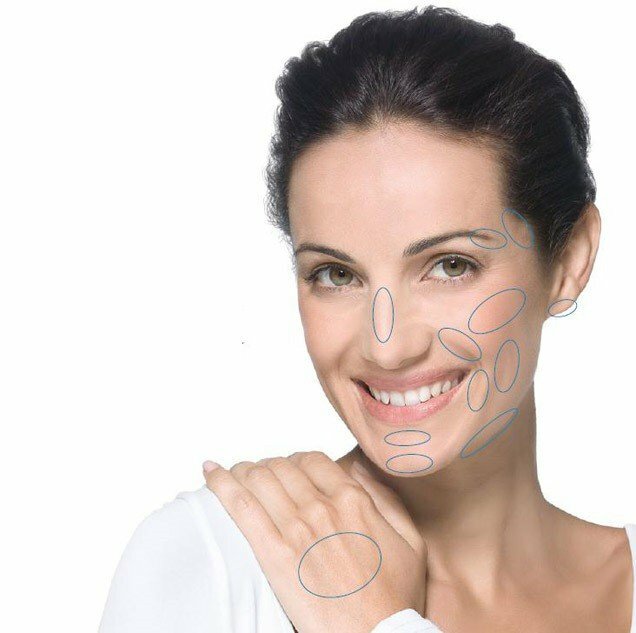 Hollow cheeks are filled effectively using Radiesse™. Marionette lines. Sad or concerned facial expression dissapears when these lines are filled in. Sank mandibular outline. Clear mandibular outline helps to maintain the youthful “V” shape of the face. Bridge of the nose. Small bumps and hollows on the bridge of the nose can be filled with Radiesse™ and smoothed. Chin line (fold). The chin fold that sank – usually, for men – can be filled with Radiesse™. The chin will look stronger. Chin. A flat chin makes the face less expressive. Small bumps on the chin give the face uneven look. With Radiesse™ skin looks naturally and expressively. The outer side of the hand. Over time, blood vessels and bones of the hand are becoming more clearly visible. When the skin of hands loses its volume, Radiesse™ injections can be performed. Filler for cheekbones, cheeks and deep wrinkles. The lack of moisture and slowing of cell division in the skin due to ageing results in lose of elasticity, tone and resilience of the skin. The consequences of the process is formation of deeper lines, especially around the nose and mouth and, sometimes, on the chin. At the same time, the thin fat tissue under the skin, which are necessary to maintain elastic and smooth, are slowly disintegrating. This volume loss becomes particularly visible in cheekbones and cheek zones. Using Radiesse™ these zones are gently adjusted. The result – returned vitality and beauty of the face that is naturally visible. When the skin becomes less firm with the age, mandibular contour sinks. Again, the reason is the loss of thin fat tissue under the skin. Volume renewal restores jaw contour and returns to the face its previous youthful form. For example, let us look at the nose, which is the center of the face and an essential feature. Some of us has a nose that is somehow incompatible with the face. Radiesse™ can help to reshape the nose and soften its defects. Hands also reveal the age. Veins and bones become much more visible in the outer side of the hand. Volume loss is reversed using Radiesse™. Who can perform Radiesse injections? Radiesse™ product has the CE certificate, which is the product safety assessment of the European Union also approved by the FDA. It is a safe product. However, Radiesse as well as other contour plastic injections can be performed by physicians only. We will be happy to give you the necessary advice on issues regarding volume reconstruction of the face and other parts of the body, and help to implement the desirable expectations. 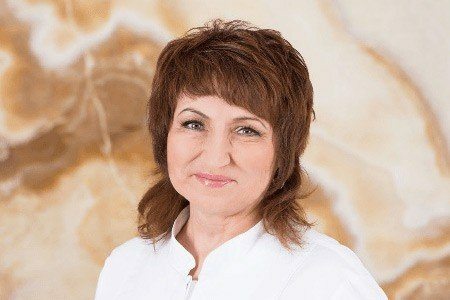 At clinic Era Esthetic Radiesse™ injections are performed by highly qualified doctor of dermatovenerology Violeta Medvedeva. Your doctor will explain you the possible treatment options and will discuss with you the one most suitable for you. You may need only one visit to the doctor to achieve the optimal Radiesse™ – based treatment result. The result will be visible immediately after the injection. How long does Radiesse™ effect last? Individual results depend on age, skin type, lifestyle and metabolic processes as well as on the zone that has been treated. 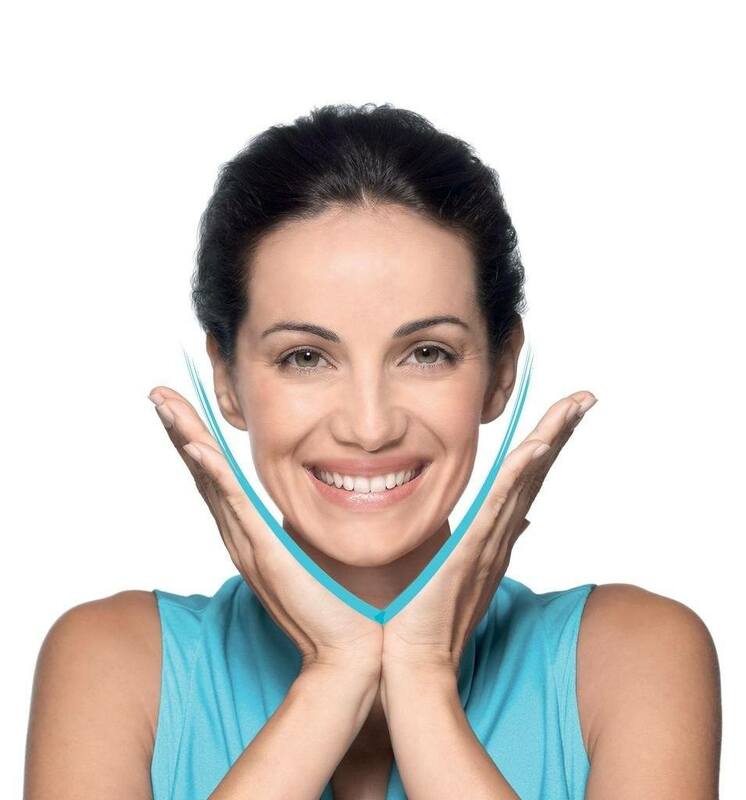 Radiesse particle structure forms an integral and natural contour, which in most patients lasts 18-24 months. Is Radiesse™ a permanent filler? No. Radiesse is naturally decomposed by the body. Radiesse is 100 percent biologically compatible and degradable product containing calciumhydroxyapatite spheres. Can Radiesse™ be used with other products? Please inform your doctor if you have had a permanent filler injection previously. Can Radiesse™ be felt under the skin? After treatment, you will probably feel the substance within a short period of time. However, over time, the substance is completely absorbed by body tissues and becomes non-perceivable. Prices vary depending on the treatment volume. Your doctor will inform you about the prices and advise you on the best possible outcome for lowest cost to achieve the desired result in your particular case. Radiesse™ injections are performed by highly qualified doctor of dermatovenerology Violeta Medvedeva.